Is your course approved by the state of Arizona? Yes! 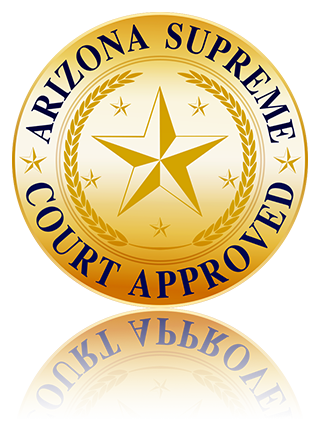 Our school is approved and certified by the Supreme Court of Arizona. Our course is accepted by all courts in Arizona. Click Here to see our certification. We offer the SHORTEST course allowed by Arizona law. ONLY 4 hours. You can complete it all in one sitting or log in and out as your schedule allows. All Arizona approved defensive driving schools are required to charge court and state fees. Click Here to calculate the total cost of the course for your court. Do I need to pay my fine to the court? If you are taking defensive driving to dismiss a ticket, you do NOT need to pay your fine to the court. The defensive driving fees cover the cost of your fine. Is defensive driving school the same as traffic survival school? No. Defensive Driving is taken to dismiss a ticket. Traffic Survival School does not remove any points from your driving record. It is typically taken for more serious infractions and can only be taken in person, not online. What are the eligibility requirements for defensive driving? If you meet the requirements below, you are eligible for defensive driving. You have not attended a defensive driving course for ticket dismissal within the last 12 months. Your eligibility is measured from violation date to violation date, not the date you last completed a defensive driving course. Your violation must be on the list of eligible violations. Click Here to view the list. If eligible, you can attend to have only one violation dismissed. If you were involved in a serious injury accident or fatal accident, you are not eligible. If you hold a commercial driver’s license, you are not eligible regardless of whether or not you were driving commercially at the time of the violation. In addition, those driving a commercial vehicle requiring a commercial license are not eligible. Click Here for more information on A.R.S.28-3392. You must complete your course no later than 7 days prior to your court/arraignment date. How do I know if I'm eligible for defensive driving? If you meet all the eligibility requirements but are unsure of the last time you took defensive driving, contact our office. We will need your name, date of birth, and driver's license number to determine your eligibility date. Is my violation eligible for defensive driving? Most moving violations are eligible for defensive driving. Click Here to view the list. If you have a criminal violation (28-701.A2A1, 28-701.A2A2, 28-701.A2A3), you may need approval from the judge to take defensive driving. Contact your court before signing up. I have a criminal violation. Am I still eligible to take defensive driving? How often can I take defensive driving? You can take a defensive driving course for ticket dismissal once every 12 months. Your eligibility is measured from violation date to violation date. If you are unsure of when you last took a defensive driving course, contact our office, and we can check for you. How do I register for defensive driving? Click Here to sign up! It's easy to get registered and only takes a few minutes. Simply fill out the registration page and make your payment. You will also need to submit a copy of your citation and driver’s license to the defensive driving school for review before you can begin. Keep in mind that your documents can only be reviewed during our office hours. If you sign up after business hours, we will review them the next morning. How do I know which court to choose when signing up? Choose the court that issued your ticket when registering for defensive driving. It is very important that you choose the correct court because we submit your certificate electronically to the court you select, and if you choose the wrong one, it may delay the process of your ticket getting dismissed. Our Arizona approved defensive driving course is easy to complete! The course consists of reading material and quizzes and is timed for a duration of four hours. There is no final exam! Once the course is completed, we will submit your certificate of completion to the court to have your traffic ticket dismissed! What do I do after I complete the course? Once you complete the course, there is nothing else you need to do. We will submit your certificate electronically to the court for you. You do not need to appear in court. If you would like to verify your case was dismissed, you can call the court on your court date to follow up. Will I be notified when the court dismisses my ticket? The court does not send any notification to us or to you when your ticket has been dismissed. If you would like to check the status of your case and verify the court received your completion, you can call the court directly to follow up. We recommend waiting until your court/arraignment date before calling to allow time for processing. No. If you complete a defensive driving course at least seven days prior to your court date, you do not need to appear in court or pay your fine to the court. Will I receive a copy of my certificate? Yes. When you complete the course, you will receive a certificate of completion to print or save for your records. You can take as much time as you need to complete your defensive driving course as long as it is done AT LEAST seven days prior to your court/arraignment date. If you are within seven days of your court date or your court date has already passed, you will need to contact your court for an extension. I completed the course, and the court says they don’t have my completion. What's going on? If you would like to follow up with the court to verify they received your completion, we recommend waiting until your court date to call. Once you finish the course, we send your certificate right away, but we also have to mail a check for the court diversion fee you paid. It can take 2-3 weeks for the court to process your completion and dismiss your case. If it has been more than 3 weeks, and the court still says they do not have your completion, please contact our office right away. What documents do I need to send to register for defensive driving? The state of Arizona requires you to provide a copy of your citation and government issued ID to the defensive driving school. You will also need to send any paperwork you received from your court (extension form, court order form, etc.). The documents must be legible for us to review them. Why do I need to send a copy of my citation and driver's license? The state of Arizona requires all defensive driving schools to collect a copy of your citation and driver’s license to verify your case information and eligibility. We cannot allow you to take the course without these documents. If you lost your citation, you can contact your court for another copy. How do I send my citation and driver's license to you? We offer multiple options for sending your citation and driver's license. When you send your documents, please be sure they are clear and legible. If we cannot read them, it will delay the process of being approved to start the course. I sent in my documents, but I haven't received notification that I can start. What should I do? Typically, we can have your documents reviewed within four business hours. If it's been more than four hours and you have not received notification that you can begin, please contact our office right away to be sure we received the information you submitted. How long does it take to review the documents I sent? Typically, we will have your documents reviewed within 4 business hours. If you sign up and send your documents after our business hours, they will be reviewed the next business day. Please note that if you do not send in the correct documents or we are not able to read the documents you submitted, it will take longer to review. Can I take the course anytime? Once we have reviewed your citation and driver's license and registered you with the court, you can take the course anytime. No! All you need to do is complete the reading material and answer the quiz questions as you go. You can retake the quizzes as many times as it takes to pass it. There is no final exam. I didn't complete the course. Can I get a refund? If you have not started the course, we can process a refund. If you have already started the course, we can ONLY refund the court diversion fee. Click Here to see our refund policy. I ran out of time to complete the course. Can I get an extension? Most courts will grant a one-time extension to complete defensive driving. Each court has different rules on how they grant extensions. For some courts, they will grant an extension over the phone. Others require you to appear in person before the judge. Call your court to find out about their extension policy. I have a commercial license. Can I still take defensive driving? No. If you have a commercial driver's license, you are not eligible to take a defensive driving course regardless of whether or not you were driving commercially at the time of violation. You are not eligible if you hold a commercial license even if it is no longer valid. Click Here for more information on A.R.S. 28-3392. I have two violations. Can I take defensive driving for both of them? No. You can take defensive driving to have ONLY one violation dismissed. If you have more than one violation, you will need to take care of the other ones through the court. I never received a confirmation email that I can start the course. What should I do? Once we have reviewed your citation and driver's license, we send an email to let you know you can begin the course. This email is automated. If it has been over four hours, and you haven't heard from us, check your spam folder or junk mail or just try logging back into the course. If you still don't have access to the course, please contact our office right away. Do I have to complete the entire course all at once? No. You can log in and out of the course as many times as you'd like. Please note if you send a check or money order, you will not be able to start the course until we receive your payment. What is the 7-day rule? The state of Arizona requires you to complete your defensive driving course at least seven days prior to your court/arraignment date. If you are within seven days or your court date has already passed, please contact your court right away for an extension. Yes. Our site is protected with the most secure server technology ensuring that your information is protected at all times. What are the benefits of taking a defensive driving course? By taking defensive driving, you prevent points from going on your driving record, and your insurance rates will not be affected. You will also learn valuable information about defensive driving and other driving techniques to keep you safe on the road. Do I need to verify my identity? The state of Arizona requires us to ask a series of identity questions when you register for the course. We will ask 10 multiple choice questions before you begin the course material. It’s very important that you write down your answers to these identity questions! You will be asked four of them throughout the course, and you will be required to answer them correctly to move forward! If you answer an identity question incorrectly, you will have one more chance to answer a different question. If that question is answered correctly, you can move forward. If you do not answer the second identity question correctly, YOU ARE REQUIRED BY THE STATE OF ARIZONA TO START THE COURSE OVER FROM THE BEGINNING. No exceptions can be made to this rule. I can't log into my account. What should I do? Check that you are on the correct website. Many sites look similar and have similar names. Use the link from the email you received when you registered to access the website. Verify you are entering your driver license number correctly. Please note – If you hold an Arizona driver license, your license number consists of EITHER of the following – 1 Letter, 8 Digits; OR 9 Digits. Check that you do not have CAPS LOCK on/off. Your password is case sensitive, so you will need to enter it exactly as you did when you registered. Change your password. CLICK HERE. You will be asked to validate your driver license number and enter either your phone number or email provided upon registration. When you receive the PIN sent to your email or phone, CLICK HERE to enter it. Check your arraignment date/extension date. Your course MUST be completed no later than 7 days prior to your court date. If you are within 7 days, you will need to contact your court for an extension. If you already received an extension, please call our office or send an email with your extension form or verbal extension date. Still not working? Call our office to speak to a customer service representative. We would be happy to assist you. © 2016 Payless - Cheap - EZ Fast Arizona Defensive Drive - All Rights Reserved.